Sometimes I get sick and tired of “traditionalist” and MMA fight claim sport martial arts being useless. When it comes to intensity and entertaining, there is no era better than the 80’s and early 90’s era. Take this fight for instance, you have one of chi-town’s great fighters, Harold “Scorpion” Burrage against Raymond McCallum. This was an interesting match up considering the reputation Scorpion has in the sport martial arts world. Both of these fighters put on a show!! This is one of the best examples what the game is missing today! I appreciate the old skool martial arts films. The music, sound effects and the lousy dubbing. They really don’t them like they use. This scene was from the iconic film, The 5 deadly venoms.. its a must watch for the old skool lovers out there! I really can’t express my love for old skool competitions. Personally, I feel like the skill and attitudes were so organic opposed to providing an ostentatious commercial feel it has today. These two guys are among some of the best fighters (still are)! Anthony “Mafia” Holloway vs. Jerry “fast feet” fontanez, founder of Reksuits, duke it out! Both fighters have their own sense of style followed allowed with strong basics. These east coast fighters always made a statement. Check out the ref in the middle killing it with that 80s swag! The 90s was a great decade when it came to the sport martial arts as whole. Take this martial artist/stuntsman/actor, Jon Valera, for instance. Jon Valera is one of the legends in the weapons and forms division. This Virginia native has won countless national and internation titles and was also guaranteed to place in the finals. Despite the fact most of the competitiors have an array of flashy tricks, there basics will not equate to the intensity of Jon Valera. The dynamic effect of his kicking makes it appear he’ll knock your head off! strong balances generates stronger strikes. This kata, Hangetsu, derives from the Shotokan Karate system. Its consisted of 41 movements while the heavy breathing and slow techniques are required! Hangetsu does have a slight dynamic change after first half of the kata is complete. Shotokan Karate is known for their hard striking. Osu! 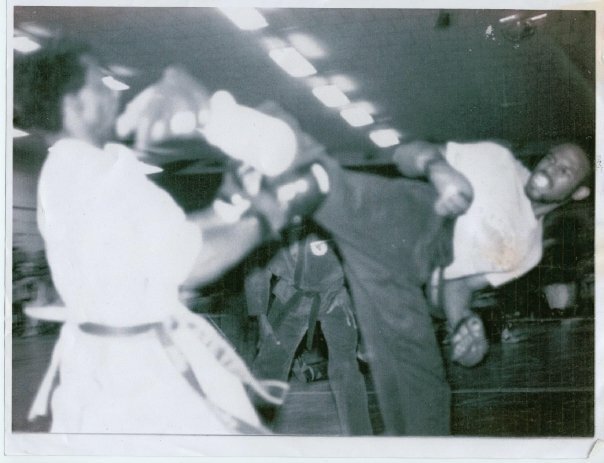 Wu-shu stylist Keith “Hirayabashi” Cooke demonstration at the night time finals back in the 1980’s! He was considered one of the great back in the day! Many people would not recognize him in the movies, but he was Reptile in Mortal Kombat and Sub-Zero in Mortal Kombat: Annihilation (best fighting scenes in both movies).